Emergency Towing Olympia: Got A Flat? Call Black Lake Towing LLC Now! Have you ever been rushing out to go to work and realized one of your vehicle’s tires is flat? Getting a flat tire is one of the worst problems to deal with because it always seems to happen at the most inconvenient time. If you’re out running errands and suddenly experience low tire pressure, contact Black Lake Towing LLC. Serving the Olympia, Washington area, our emergency towing company will take excellent care of you and is dedicated to your safety. Call us today! Unless there’s a gaping hole in your tire, it can be difficult to tell if you have a leak. Check your tire pressure at least once a month. When the thermostat outside rises, so does the pressure in your tires. A good rule of thumb is that for every 10 degrees that the temperature increases, a pound of pressure is added to your tires. If your tires aren’t rotated regularly, then overwearing is a serious issue. 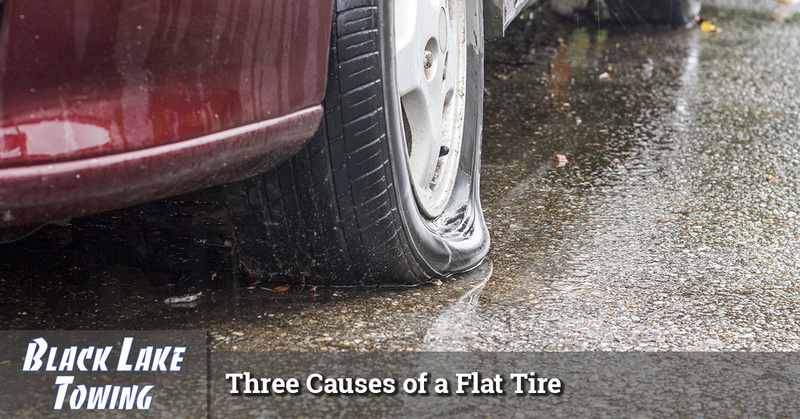 While scheduling a tire rotation into your busy life may seem irritating, you’ll appreciate your forethought when you’re not stuck on the side of the road with a flat. Call Black Lake Towing LLC now for all of your emergency towing needs in Olympia, Washington!